The African Development Bank President Akinwumi Adesina on Tuesday made an impassioned call for investors to join the partnership platform offered by the Africa Investment Forum and “grab the chance to fast track the continent’s investment and development agenda". His message was a clarion call to regional and global investors, financial sector leaders and prominent government officials who filled the Africa Room auditorium of the Sandton Convention Centre in Johannesburg, South Africa, for a plenary session entitled “Delivering As One for Africa,” on the first day of the Forum. “We must fast track Agenda 2063,” Adesina urged. “To deliver as one. We are impatient to get there,” he added. The opening plenary featured heads of leading Development Finance Institutions and Forum partners, including Patrick Dlamini, CEO, Development Bank of Southern Africa; Professor Benedict Oramah, President, the Africa Export-Import Bank; Dr. Bandar M. H. Hajjar, President, Islamic Development Bank; Admassu Tadesse, President, Trade and Development Bank; Alain Ebobisse, CEO, Africa 50; Mallam Samaila Zubairu, CEO, Africa Finance Corporation. The Bank’s partners acknowledged that with all the multilateral institutions in the room they had the capital needed to tilt the investment balance and channel much needed investments into Africa. Officially kicking off the Forum, Manemolla David Makhura, Premier of Gauteng referred to the Africa Investment Forum as ‘historic and the ‘first of its kind.’ He further indicated that Africa needs to move from poverty to prosperity. ‘We want the 21st century to be the African century,’ he told delegates. 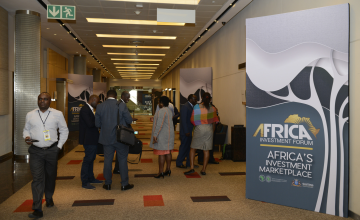 The Government of South Africa, the African Development Bank and several multi-lateral development partners are hosting the Africa Investment Forum in Johannesburg and is aimed at attracting multi-billion-dollar deals across the continent. The Africa Investment Forum is the first ever transaction-based Forum, “This is not an event. It is a platform where governments, private sector, investors, and project promotors come together. We develop quality bankable projects, de-risk them and actually make sure it happens,” Adesina said. ‘We are committed to fast track development. We know countries do not develop from aid but by the discipline of investment. We require broad-based partnerships and collective effort with the private sector and institutional investors,” Adesina further noted, before commending the leadership of Ghana’s President Nana Addo Dankwa Akufo-Addo, also present at the opening ceremony. Panel members shared their vision and perspectives on investments in Africa and stressed the urgent need to transition to a new way of working together. This will take scaling up, speeding up and synergizing. Panelists acknowledged the critical role of African leaders who set the tone in terms of policy and creating conducive environments for businesses to thrive. The Africa Investment Forum is part of a much bigger drive by the African Development Bank to tap into the vast pool of global capital to fund its ambitious plan to transform Africa. The Bank estimates the continent needs between US$130 billion and US$170 billion a year to fund its critical development needs. Due to tightening budgets, traditional funding sources such as national governments and development institutions like the African Development Bank alone are unable to meet Africa's capital needs. Global institutional investors and asset owners control US$ 131 trillion Asset Under Management, of which Adesina said, even one percent would be sufficient to close the infrastructure financing gap, estimated at between US$68-US$108 billion. The Africa Investment Forum runs from 7-9 November, 2018. Copyright © 2018 African Development Bank. All rights reserved. Distributed by AllAfrica Global Media (allAfrica.com). To contact the copyright holder directly for corrections — or for permission to republish or make other authorized use of this material, click here.